​AG & T. In their victory, they get to try all the new Mastercore video games, gadgets, and tech cross vehicle releases before anyone else in the world. 1) Audiobook: Buy it in one single listen-through file that's easy for downloading. Great for a 1-hour car-ride! 3) Teacher Audiobook Supplement Guide - Great for teachers, parents & kids: Buy this inexpensive accompanying eBook with chapter summaries, images, tricky word definitions, memory quizzes, and questions for the reader. Are you a young person thinking about moving out, but not sure what to do? Have you just started living on your own recently, but your first experience(s) left much to be desired? Have you asked: How can I do this better? Are you a parent/guardian, not quite ready to let go, but realize your kid will be moving out sometime soon, and you haven’t a clue as to how to give the right advice about how youth are making it out there today? Are you in social work, supporting youth, but just don’t have the time to help them all, nor the precise tool to support young Canadians moving out? ﻿﻿Moving Out! 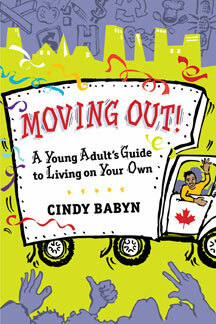 A Young Adult’s Guide to Living On Your Own is a practical and philosophical book on how youth can look for apartments, find movers and roommates, budget, stand up for their renting rights, effectively overcome homesickness, develop good health and social habits, respect the environment, and live with all the cultures of the world in one of our great Canadian cities. 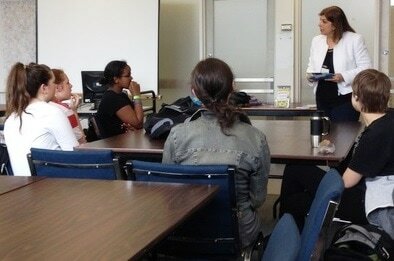 I've given Moving Out workshops to youth to help them prepare for independent living: Ryerson University, Massey Centre for Women, Bayfield Treatment Centre, Maple Star Foster Care, and at the Festival of Trees (Toronto and Ottawa). Media: Cindy has participated in live-to-air interviews on CBC: All in a Day (Alan Neal), Ontario Today (Hallie Cotnam); Rogers Daytime Ottawa; CFRA News Talk Radio; Kootenay Co-op Radio; and has been interviewed by the Associated Press, The Ottawa Citizen, Metro News Ottawa, and other publications. While all quite different, these moving stories share a common thread of mystery, discovery, and personal courage. They reveal transition journeys through the spectrum of drama, humour, growth, joy, love, and heartache. "Married Couple Moves Into the Nearby Seniors' Residence"
When Herbert got the "wanderlust" and had to be located with the help of police services, Eileen's daughter thought it was time that her elderly parents, married for 70 years, should move into a senior's residence. "The idea of it gave me a funny feeling. I was wondering what it would be like and what kind of troubles I was going to face with a move like that," said Eileen. "There's no place to lock things up, so sometimes my things get stolen, which is very upsetting." On the other hand, Eileen is glad to live in a place where she doesn't have to do any house work, and she enjoys connecting with the church on the first floor of her residence. "I'm the happiest that I've been anywhere." "At Eighty-Six, I Bought A Condo"
Meet Helen, the self-described 'Junior-Senior', who at 86, left the neighbourhood and the street that she loved, and the house she'd lived in for 43 years, as she bought herself a condo. "It was quite a relief for me to move into this condo. It's definitely less work to keep it tidy. My neighbours are very nice. Sometimes they bring me food, and sometimes they bring me flowers...I'm better off being on my own than in living in one of those seniors' homes. Oh, I just don't want to live in one of those. I fight like hell against it!" "The Dreaded Call Home: It's Always Last Minute"; "One's Gone, One to Go"; and "Hobby Farm Living Was Good for the Family": These three parents' view stories give a bird's eye view of some of the thoughts, feelings, frustrations, and concerns that parents go through when their kids move out. There are certainly a few insights youth can glean about what to do and what not to do to make moving out go a bit more smoothly! "Proud Arab Canadian Woman Takes a Path Less Travelled"
As normal in her culture, Asoomiijay entered into an arranged marriage at 19 - and it didn't go well. She mustered up her courage and left her husband, looking for apartments by herself, and financially supporting herself for the first time - all while studying to get a Bachelor's degree and establishing a hijab-selling business online. Due to cultural pressures, she kept her divorce and departure a secret from her friends because she didn't want to face more judgement and pressures. Read the Canadian rental adventures of Asoomiijay who was left high and dry as her roommate skipped out on her without paying the rent, and stealing one of her suitcases to boot. She says: "I'm not sure why, but for some reason there's a lot of drama in my life!" Moving into a new neighbourhood can mean dealing with weirdo neighbours! Like this guy next-door who likes to stare at Karine while she huffs and puffs away shoveling her driveway as he non-chalantly clears his side with a snowblower and never offers to help her. Oh, he also apparently likes to look through people's garbage, look through their front porch window, and steal his neighbour's lawn chair - blaming it on the wind, of course! "Blind Guy Has No Trouble Moving at All!" This story may very well need a cool sound track to go along with it! Meet Rocky, affectionately known to his music Bomp List enthusiasts as "El Squirello". Some people say that the most stressful life events are: getting married, changing jobs, and moving. Here's a blind guy who did all of these three things in the span of one month and talks about it as if it were "a piece of cake"! Well, maybe that's just the kind of experience that a confident person named Rocky is destined to have! A cool wife, a CNIB instructor, a supportive boss, and loving parents, can certainly also be attributed to this very positive move! "I Hate the Snow but Love the Multiculturalism"
When Moyo moved to Canada from Nigeria, he decided to repeat his last year of high school in Canada to test out what it was like to be in a Canadian learning environment, before trying to get into a Canadian university. His family placed him to live with a Jamaican family where he tried gravy for the first time - and loved it! Moyo also learned that he loves the multiculturalism in Canada, finding a big Nigerian community in Toronto to relate to, but he hates the snow and can't get used to it! You can probably guess what kind of moving experience he had when he paid the mover in advance, before he'd moved all his stuff into his new apartment! "My Online Chats Brought Me to Canada to Be with the Love of My Life"
Just how was it that Miriam left Slovakia, worked in Italy for four years, then made her way to be with the love of her life in Canada? Why, online dating of course! 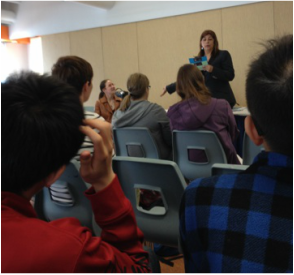 Learn how Miriam settled in our fair Canada: "Canadians are nice and there's very little social differentiation in interaction between the rich and the poor," says Miriam. With English as a Second Language classes for three hours every night after work, establishing a thriving business by day where she practiced her English, being with her love, and finding all the great places to go snow boarding, Miriam has found a welcoming new home in Canada! "Working Out West in Canada's Pipeline Projects"
Mehmet heard the call to move west, where jobs are plentiful working on Canada's pipelines projects. Way up north, he lived in a 'camp' of about 300 people who live in trailers, sharing bathrooms and dining quarters, working 12 hour shifts, six days a week. With all the lodging and the most delicious food he's ever eaten in his whole life were covered by the company, Mehmet was creating a brighter financial future for himself, and meeting a lot of very interesting young people from all across Canada in the process! "Teaching English in South Korea"
Don wanted to try living abroad, teaching English, in a country that had winter months so he could keep up his love of speed skating. When he arrived in Korea, he learned all the many trials of apartment hunting in a totally different culture - like having to put down an enormous lump sum cash payment so the landlord earns money off the interest, or how complex addresses are, or how to not cause a cultural faux-pas by making sure to take off your shoes upon entering any dwelling - even if you're carrying heavy furniture on moving day! At a time when the success of his band was fizzling out and his relationship with his girlfriend was on the fritz, Phil decided to pack up his life and move to India for Vipassana meditation studies. Moving across India in several meditation centres, he would volunteer to help the centres run in between his own meditation centres. Teaching English to Buddhist monks and trying "butter tea" - the most disgusting tea he's ever had (with yak's milk) are just some of the experiences he had. "From Studies in the UK, to Living in Canada's Far North"
Obtaining Canadian government funding from the Social Sciences and Human Resources Council for his graduate education, Kevin completed one PhD year at a university in the UK, then started one year of studies 'in the field' in Canada's north. Just getting up there was an adventure, as Kevin was introduced to the cabin-mate on his boat who appeared out of the darkness of the room in nothing but his undies! As it turned out, this guy was one of Labrador's most famous Inuit carvers and an 'ice harvester' to boot! Don't know what an ice harvester is? Read on and learn more about what it's like living in Canada's north and joining an elder on a 10-day hunting trip. "There's A Whole Lot of Movin' Goin' On"
Tiffany had a whole lot of moves in her life, from foster home one, two, and three, and sometimes back and forth in between those homes. The most egregious shock was perhaps coming home from the mall while picking up her new glasses, to find a "for sale" sign on the lawn - that's how she 'got the news' that she'd be moving yet again. However, life got better. Tiffany found some solid footing and even learned how to manage to live on a supremely tight budget. "I Was in it Alone: It's Been a Tough Life But I've Had a Few Angels in My Corner"
Adopted from his birth family at age one, Carlos did his best to fit into his new home but one day he just couldn't take it anymore and chose to sleep overnight under the slide at his public school. "What are you doing there, Carlos?" his friends asked when they found him there. Then, a guardian angel appeared to pivot his life into a new direction. From an assessment home, to foster homes, back to home, and to life on the street, Carlos picked up 'street skills' that he used when he landed in jail. With one call to his foster family, they graciously bailed him out. The justice system levied alternative sentencing, which is where through volunteer work he found opportunities to increase his skills, his confidence in himself, and found a belief that he could live his life on the straight and narrow, which is just what he did by getting himself through post secondary studies!